Seems like he’s not interested, so why does he stay in touch? Check out these reasons why a man contacts you even if he doesn’t want to see you. Why Is He Still In Touch? It’s so infuriating! 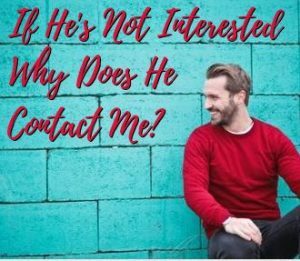 If he’s not interested, why does he keep contacting you? You wonder, “Why doesn’t he want to meet you in person” or ask you out? While it drives you crazy and seems to be a complete waste of your time, he must be getting something out of this right? Let’s look at a man’s motivation and why he would keep calling, emailing or texting, even though he’s not interested. Below I’ll share five of the most likely reasons that keep him connected to you. Men get lonely too. Even if he doesn’t want to date you, sometimes talking to you is just the soothing emotional balm he needs to feel better in that moment. When you answer his call or text, he feels connected to SOMEONE. And for him, that’s a big relief and enough. As far as he’s concerned, he doesn’t need to take it to the next level and actually SEE you. Nope, he’s content with a quick fix and staying in touch. This is one of those signs he’s not interested anymore or perhaps never really was. Sometimes when a man gets dumped, he reaches out to his ex to boost his ego. This is most likely true if he knows you are still into him. Ahhh, what could feel better than getting in touch with a woman who is always happy and pleasantly surprised to hear from him? A little time talking to you and he starts feeling better quickly. Your warmth is like salve to his wound of being dumped and he knows he can rely on you to pump up his tarnished ego. Some men (and women) just LOVE to flirt! And you are FUN to flirt with, so he stays in touch to get his flirty fix every so often. He might have a bevy of babes he flirts with because it’s one of the joys of his life. There’s nothing wrong with flirting, especially if you enjoy it. Just don’t think it MEANS anything or that he has any intentions of wanting more from you. Certain men can be needy and the keep who keeps calling or texting is one of them. He needs attention, wants someone to complain to, or could use some advice. You are always there when he needs you because you know how to be a great friend. Women have been known to pour their empathy out for a man like this thinking after providing all that emotional support, he will surely love you. Sadly, this is NOT true. You are simply giving and giving to someone who is more than happy to take whatever you’ve got with nothing in return. He’s not interested except to take whatever you will give. There won’t be a return on this investment, so move on. Do you wonder is he texting me out of boredom? If that thought even crosses your mind, the answer is YES. Some people get through a day at work by texting. They say funny things and find ways to entertain themselves. So, while you may be enjoying all the humorous texting, it means nothing in terms of building a true, love relationship. Here’s how to know if he’s not interested and just texting because he’s bored. He does NOTHING to see you or set up a date. Just because he’s texting constantly, doesn’t mean he sees himself in a relationship with you. He might think texting with you is fun and makes the day go by faster. Sometimes this happens after a few dates with a guy and things dwindle to texting only. You might hang in there thinking at some point it will turn back around and you’ll start dating again. You wonder why is he still texting me if he’s not interested? Simply stated, he could be bored and you provide a break from his dull day. What To Do If He’s Not That Into You? Now that you are clear on five of the most frequent reasons why a man stays in touch, but doesn’t want a relationship, I’m sure you want to know what you CAN do about it. Even though this is hard to swallow, there’s only one thing you can do. STOP texting or talking to him. In fact, let’s take things a step further and BLOCK him. This is how you move on with your head held high and plenty of dignity. You might hesitate, thinking if you could just talk to him, he’d see the light and things would return to how they once were. Or if you could discuss this openly, you could somehow convince him to date you. Too bad your instincts are working against you here. Blocking him and moving on are the only steps you can take that will change the status quo. You’ll will not draw him in, but you will FREE yourself up to meet a new man! It’s time to cut him lose and stop wasting your time. If you’re in touch with a man sending you mixed signals, get my Free book His Mixed Signals Are So Confusing: Find Out What He Really Means today! Heloise – it’s up to you to set proper boundaries and be firm about them. Even though it’s hard, wouldn’t you rather get attention from a man who isn’t engaged? Be true to yourself and block him. Thanks for this..I have tried some many times to get this guy off my back but its so hard cause most at times..we see each other and also he had told his fiance about me and also told her he loved us both but he still finds it hard to stay away from me..